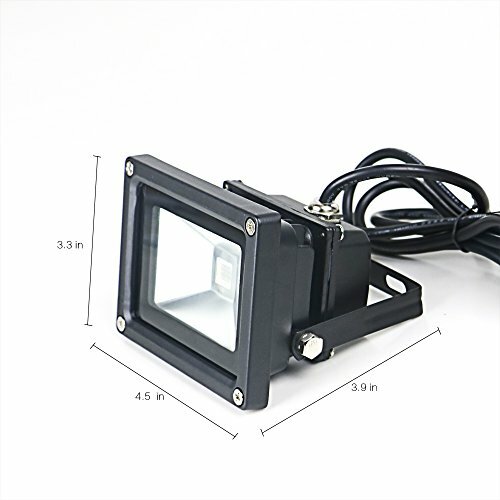 THANK YOU FOR BROWSING AND BUYING YQL UV FLOOD LIGHT! 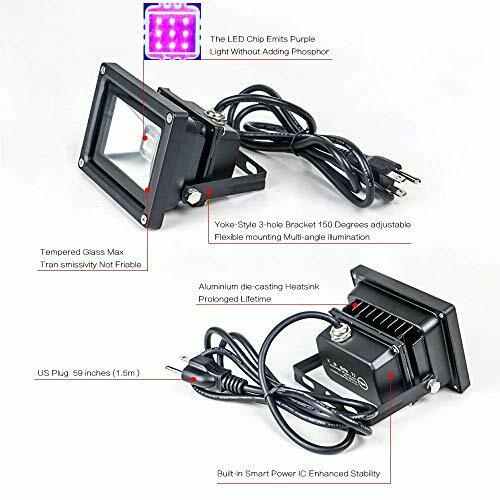 This UV LED Flood Light is lightweight and portable, specific fluorescents paints with 1LED x 10W Black Light, Metallic Black,so it would be perfect if you on the move stage Lighting. * The shell is made of high-strength aluminum alloy material,Shade material made of Extra-strong tempered glass. * Classic UV black light effects bar Lightweight, portable unit, totally plug&play. * Easy control by Plug switch, high power ultraviolet light unit. * Create stunning atmospheres at gigs or parties, works great with UV body paints & fluorescents. 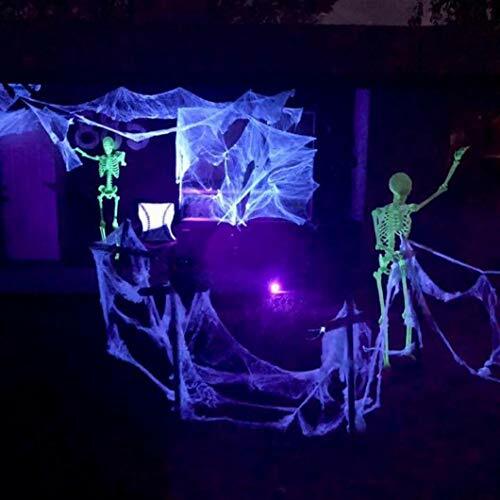 * Ideal for club, events and birthday party.Can be used with other party supplies,glow bar,glowsticks,glow bracelets,glow becklaces,it's a good DJ neon flourescent or stage lighting or UV lights. 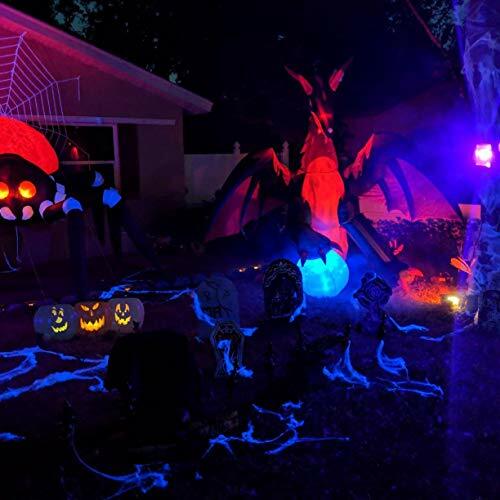 *Shine on Some Objects Blacklight Reactive - Make fluorescent effects in the dark,for example:UV balloons,UV face and body glow paints,UV lipstick,UV nail polish,UV eyeliner and mascara,ultra violet nail polish,neon color gangster hats,glow in the dark tape,UV poster,and so on. * Installation:150 degrees adjustable brackets , easy setup on the wall and the floor. Q: Why does it look more bleak than the usual 10W light purple? A: Because the UV is the level of UV-A,385nm - 415nm,this is the most obvious UV light and the longest wavelength,they emit blue violet light,but unlike ordinary purple,some fluorescent pigment can emit strong fluorescence effect under its irradiation. 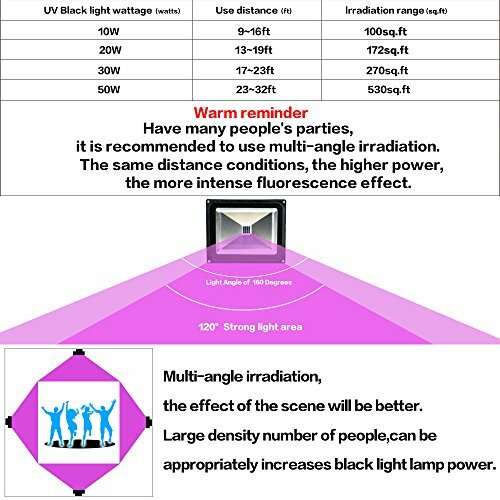 Please use the YQL professional manufacturer of ultraviolet lamp, safe, fluorescent effect is better. NOTE1 - Please understand the true purpose of this luminaire, this is a UV lamp. Main use: UV glue curing. 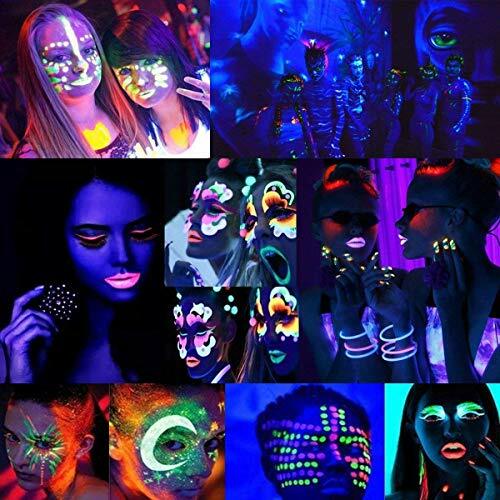 In the party, the uv light-emitting paint on the face or body or on the clothes will produce a fluorescent effect, and the ornament with the fluorescent agent will produce a fluorescent effect to create a party atmosphere. NOTE2 -Not recommended as a lighting fixture, because it is UVA band, visible light is very weak. Its brightness is not reflected in the intensity of visible light, but the strength of the fluorescence reaction. 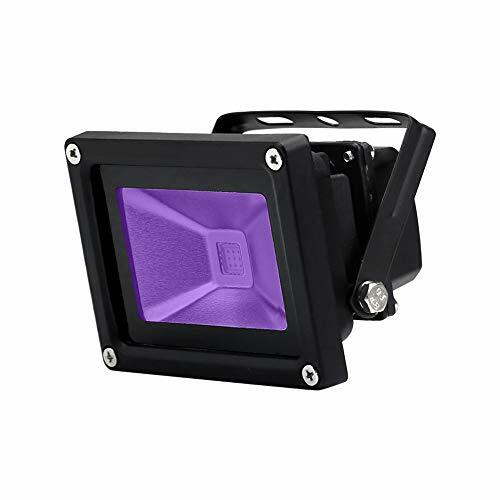 Product parameters -10W Full Power UV blacklights, Wavelength 385nm-415nm, waterproof IP65, security UVA level, wide voltage AC85V-265V, 120 degree luminescence angle.150 degree adjustable lamp body bracket,to achieve a large area of black light irradiation,can Be used outdoors and indoors,with us plug. Application Scenario - Birthday DJ club party bar disco beon party,concert show,plays,events and gallery,UV LED bar,bedroom,UV light bar,night clubs,aquarium lighting,UV Art,blacklight dance performances.Can be a perfect substitute UV Blacklight bulb,black light Led strip,UV bar light,ulvioviolet light strip. 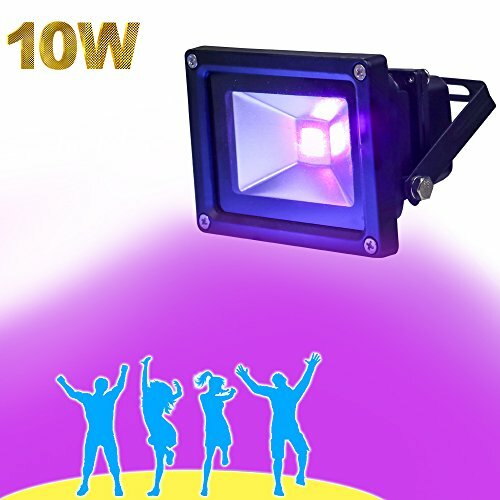 Portable,Safe and Easy to Install - Aluminum alloy shell,tempered glass,lightweight and durable,commercial grade waterproof,high end luminescent chip and driver,safe and reliable.can be easily installed on any surface or pillar. Sales warranty service -The warranty Period of 12 months,you also get our super friendly customer service and lifetime technical support .So please feel free to contact us if you have any questions or requests. If you have any questions about this product by YQL, contact us by completing and submitting the form below. If you are looking for a specif part number, please include it with your message.